Ever since Lovejoy Bakers opened in late 2009, I’ve been captivated by the lights hanging above the long dining table there. Soft, subtle, and anthropomorphic, they lighten up an otherwise rather sharp-edged interior. So I was recently thrilled to see that the lights are made right here in Portland—and are available for sale on their etsy site (if you don’t see these lights in their shop, convo the couple as each one is handmade so they’re sometimes not listed). Designers Jennifer Jako and Christopher Bleiler, the husband and wife team behind Fix Studio, created the whole look and feel for the new bakery, instilling their own thoughtful style of sustainability and modernism in the space. True to form, they also custom-made some of the furnishings (such as the industrial-looking counter stools), as well as the lights. "I was inspired by the way dough folds and turns in on itself when you’re baking, as well as the shape of mixing bowls," says Jako. "And that’s how these forms came about." Educated at PNCA, Jako remembers playing with clay in her college sculpture classes, and these shapes have that hand-molded, hand-crafted feel. Everything is made here in town, from a local ceramicist creating the porcelain shapes to the wiring and even the ceiling canopies. 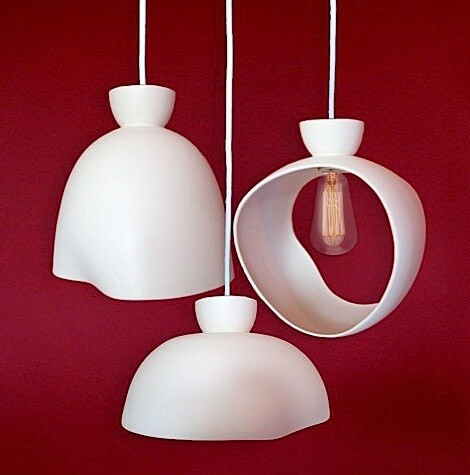 As for the pendants themselves, the white porcelain finished with a matte glaze is the perfect material for evoking flour-covered shapes, and they’d look perfect in a row shining over a kitchen island or in a grouping over a dining table. Or even one small pendant, hanging in a hallway or bathroom, would surely warm up even the coldest of rooms with their subtle evocation of baked bread.